Visitors to Gunwharf Quays in the 21st century may deduce from the name that the site probably played a part in the military history of Portsmouth and may garner further details from the several plaques adorning variously, torpedoes, mines and buildings, but they may not appreciate that prior to the 18C the land on which they stand did not exist. Had they for instance been able to accompany King Charles II when he visited Portsmouth in 1662 to inspect the town and dockyard, they would have travelled between the two along what is now Gunwharf Road, across a bridge and along Ordnance Row to The Hard, all the while seeing open water to their left. Some historians place Gunwharf on the site of King Richard's dock, the first to be built in Portsmouth. Whilst it is certainly close to that spot evidence for the exact position for the dock is too sketchy for this to be stated with confidence. What can be said is that almost all of the area now known as Gunwharf was mud flats, only exposed at low water, until the first decade of the 18C when some 60,000 square yards of mud bank were surrounded by a stone wall and filled in with earth thereby extending the shoreline some 350 yards into the harbour. The date for the construction of Gunwharf is generally given to be 1662, but this is too early as there exist several maps drawn after that date on which Gunwharf does not appear. 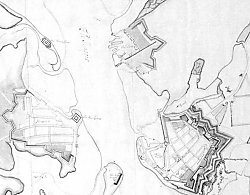 One such example is a map of 1679 by Thomas Phillips, drawn for a review of the existing fortifications. 1662 is almost certainly cited as Patterson and others quote it as being the year in which Col. M. Legge, Lieutenant of Ordnance was issued with a warrant for £3822 "for the purchase of ground, buildings, structures and the making of a wharf at Portsmouth for the use of the navy". There are three problems with this. Firstly, the Lieutenant of Ordnance in 1662 was William Legge; secondly the Calendar of State Papers Domestic (CSPD) for 1662 makes no reference to this warrant; thirdly it does not refer specifically to Gunwharf whilst the CSPD does refer to at least five other warrants being awarded in 1662 for the building of docks and wharves, almost all of them payable to Sir George Carteret. A further concern is that the construction of Gunwharf was a massive project and 1662 was the beginning of a period when the King's chief Military Engineer, Sir Bernard de Gomme was re-fortifying Portsmouth and it seems unlikely that works of such a size could have happened at that time without him being involved. 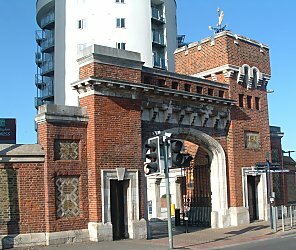 This is supported by Andrew Saunders, who, in his meticulous biography of Bernard de Gomme entitled "Fortress Builder", makes no mention of Gunwharf nor any works which could have been associated with it. In any case it is difficult to imagine where the required workforce would have come from at the time given the significant numbers of labourers then involved in the remodelling of the ditches and ramparts around Portsmouth. The most accurate date for the actual construction comes from the maps of the period, in particular an anonymous publication dated c1700 with possible amendments in 1706 and 1709 [PRO MPHH 516 (formerly WO 78/1426)]. The commentary on this map as published in the Portsmouth Record Series starts by referring to a 'plan for proposed Gunwharf...' and goes on 'original, unbuilt version of Gunwharf is shown'. The commentary also quotes the State Papers for 12th September 1699 - 'The Board of Ordnance reported that "the wharf where our guns lie is not in very good condition.....it might be better to have another wharf built particularly for the guns"' (this may well have been a reference to the Ordnance wharf at Point which had been leased to the Board for 99 years in 1676 - see, The Last House in Portsmouth). It ends by quoting PRO WO 55/1548 (10) which contains a report on Portsmouth defences by Talbot Edwards dated 20th March 1707-8 stating that the Gun Wharf was being filled in with earth during the previous year. The area reclaimed from the sea around 1706 formed only one half of the modern Gunwharf Quays. It lay between Ordnance Row and a creek which led to the Mill Pond and which was located in approximately the same position as the canal which divides the current commercial development in the north from the residential quarter in the south. There seems to have been some protection provided for Gunwharf in the form of a ditch and palisade which separated it from Ordnance Row but it was not as extensive as the fortifications around Portsmouth and the Dockyard. From the outset the role of Gunwharf was to act as the main repository for the navy, supplying and maintaining the guns, small arms and other ordnance. It would receive the armaments of ships going into ordinary (mothball) or refit and supply ships outward bound to war, commercial protection or even circumnavigation of the globe. Gunwharf did store some gunpowder but the main repository remained in the Square Tower in Portsmouth, much to the consternation of local inhabitants, until 1777 when Priddy's Hard on the other side of the harbour was constructed. Operations at Gunwharf continued unabated for most of the 18C but in 1797 a review of resources came to the conclusion that more land was required and to this end the Board of Ordnance ordered that a further section of the harbour, to the south of the creek, would be reclaimed. 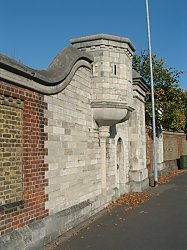 Once this was complete a boundary wall was erected with two fine gates on the piers of which were placed stone mortars (see left). 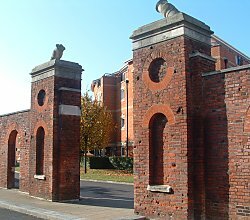 The southern section of Gunwharf was later extended landwards with a new wall constructed, thereby isolating the original gates which have survived to be incorporated into the modern housing development. The foundation stone for the Grand Storehouse (now the Vulcan Building) was laid by the Duke of Clarence on 28th November 1811 and the whole complex was completed in 1814. In 1888 a further review split the two halves of Gunwharf with the army taking over the northern section and the navy the southern. 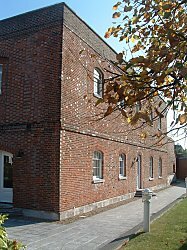 Responsibility for Gunwharf remained divided until the First World War when, in 1915, the two halves were re-united under the Admiralty with the army being relocated to Hilsea Barracks. 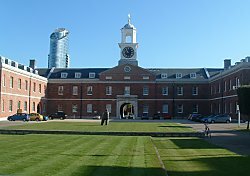 After the end of the war, in 1919, the southern half of Gunwharf was taken over by the Mines School, followed later by the Torpedo school in the northern half, before in 1923 the whole of Gunwharf became the Vernon Shore Establishment. In 1866 Robert Whitehead, a marine engineer, developed his Whitehead-Luppis torpedo which used a hydrostatic plate to maintain submerged depth. Although some experiments with torpedoes had been carried out by the navy prior to Whitehead's breakthrough the new model with it's potential to revolutionise warfare at sea enthused several officers, including Commander H.C. Kane who was at that time attached to the gunnery school at HMS Excellent. Kane began laying down the principles for the study of torpedo warfare as a separate subject within the school with the blessing of the Excellent Captain A.W.A Hood, but within two years he had been succeeded by Lt. Jackie Fisher who was promoted to Commander almost immediately. Hood and Fisher set up the new school in the hulk HMS Vernon which was then a tender to the Excellent, whilst experimental trials took place from 1885 at Horsea Island. At about the same time Excellent and Vernon went their separate ways, Excellent to Whale Island in the late 1890s and Vernon to Gunwharf in the 1920s. Although the name of Vernon would become synonymous with the torpedo and the mine, the association was entirely accidental. The name of Vernon originated with Admiral Edward Vernon who was born at Westminster on November 12th 1684 and went on to become a successful and much loved naval captain and occasional member of Parliament. He died in 1757, leaving behind not only a cherished legacy but also his nickname 'Old Grog' from which the name of the navy rum ration was derived. Even before Vernon had died his reputation was such that his name adorned a new ship built in 1739 and though neither it nor the two succeeding ships that used the same name were naval vessels they all served the government. The second Vernon was built in 1741 which meant that there were two ships afloat at the same time with the same name. The third Vernon first sailed in 1781 but it's fate after seeing action in a various theatres of war is unrecorded. It is the fourth ship bearing the name of Vernon that is of greatest relevance to subsequent events. Known as the 'Symondite' frigate after her designer William Symonds, the fourth Vernon was often described as "the most magnificent frigate ever built by any nation". She was constructed in 1832 to a radical new design which made her more stable and much faster than her contempories though she attracted as much criticism as adoration from her commanders. For 16 years HMS Vernon served during many engagements with great honour, but in 1848 she was paid off at Chatham and spent the next nineteen years laid up until in 1867 she was briefly moved to Portland where she served as a coal jetty before being moved once more, this time to Portsmouth where she was set up as a tender to HMS Excellent. Once the torpedo school on Vernon had separated from Excellent other hulks were added to the complex, all of which were moored in Fountain Lake, north of the Dockyard. First to arrive was the Ariadne (also in 1876) which served as living quarters followed by Actæon (1876), Donegal (1886), Marlborough (1904), Warrior (1904) and a number of smaller vessels. The whole group were known collectively as Vernon with some renamed Vernon I, Vernon II and Vernon III. In 1895 the whole of Vernon was moved to Portchester Creek as Fountain Lake was becoming too crowded. It may not be obvious to us today but in 1867 the torpedo was considered to be a variety of mine so it is not surprising that the two weapons were developed alongside each other from the beginning. Both the torpedo and the mine were fired electrically, this being the first application of electricity to warfare, and as a consequence the Torpedo branch became inextricably linked with electricity. As the two schools grew it became increasingly obvious that they could not remain afloat for ever. 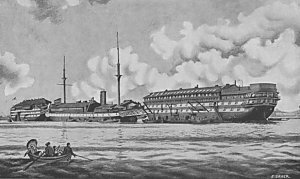 The first move to bring them ashore involved the Mining School which was destined for the southern half of Gunwharf, the half under the control of the navy. This was largely achieved by 1919 with the Torpedo and Electrical Schools following shortly after to be allocated the northern half of Gunwharf as soon as the army had vacated the premises. Once safely ashore and settled down the whole of Gunwharf became known, on 1st October 1923, as the Vernon Shore Establishment (see 1930 plan). Left behind, the ships that had formed the original Vernon were soon on their way to the breakers yards, all that is except Warrior and Marlborough which sank at sea on it's way there. After the Vernon Shore Establishment closed in the 1990s the whole of Gunwharf was taken over by the Berkeley Group and redeveloped as a commercial centre to the north and residential accommodation to the south. Most of the original buildings were demolished but much of the boundary wall, both North and Original South Gates, the Lock Keepers Cottage, the Old Infirmary, the Grand Storehouse (Vulcan Building) and the Administrative Block (The Old Customs House) have survived, as has the figurehead from the fourth ship named Vernon.